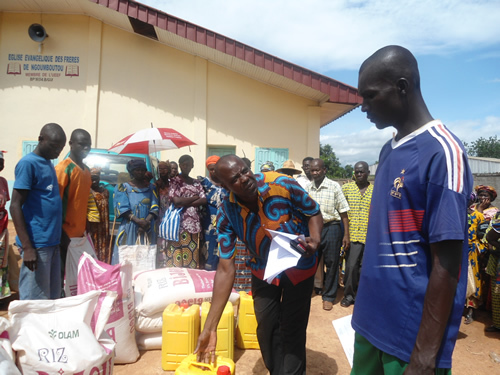 GraceConnect » Wooler Reports on Humanitarian Efforts in C.A.R. Wooler Reports on Humanitarian Efforts in C.A.R. two truckloads of seed and gardening tools left Bangui for three drop-off points to the north: Bossembele, Yaloke and Bossangoa. From those three towns most of the 20+ Grace Brethren Churches that host Hand in Hand orphan schools came to pick up garden supplies they need for a 2014 winning harvest. the Grace Brethren Committee of Coordination in Bangui is launching into a large project that will provide food, seed, and garden hoes to some of the hardest hit areas of the C.A.R., including Paoua, Bozoum, and Bossangoa. Pastor Feyboi Ferdinand has purchased $3,100 of food and seed, which will be distributed to the deep-forest Pygmies the first week of June. She has also reported on non-food humanitarian projects, including a chapel at the Airport Displaced People’s Camp where, sadly, about 30,000 people are still living; shelter for several Project Hope & Charité (PHC) widows; and a plan to draft and implement a strategy that will blanket the C.A.R. with trauma healing workers. Click here to read her complete report.